Certificate of Expert in Higher Education in activities related to European Higher Education Area (EHEA) and innovation projects (Quality and training unit, UAM, 2012). 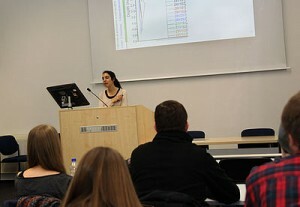 More than 250 h on higher education training and implementation of a teaching change project for the first-year group of Biology during the 2009/10 academic course. As a result of the project, a dissertation about the comparison of two didactical methods and the influence of integrating information and communication technologies (ICT) was defended in public. Six years of teaching at university >500 students in UAM (2008-13) for Geology (B.S. in Biology, 325h), Waste (B.S. in Environmental Sciences, 26h) and Mineralogy & Mineral genesis (B.S. in Chemistry, 8h) and in University of Sheffield (2018-19) for Water quality. Supervision of two postgraduate international students and two PhD students. Participation in four teaching innovation projects. Publication of several teaching materials such as research articles, conference proceedings and textbooks.